Pastor Douglas Hoag was born and raised in Detroit, Michigan. He is a 1981 graduate of Lutheran High School West in Detroit and holds a Bachelor of Science degree in Electrical Engineering from Lawrence Technological University in Southfield, Michigan. After working 3 years in the engineering field he decided to enter the pastoral ministry and attended Concordia Theological Seminary in Fort Wayne, Indiana, graduating in 1993 with the Master of Divinity degree. 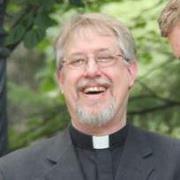 Pastor Hoag has served parishes in California and Iowa, and has served Trinity since 1999. Pastor Hoag is married and has two children. He enjoys reading, writing, classic rock and heavy metal music, movies, sporting events, and social media. Pastor Hoag writes articles for the New Lenox Patriot. He is involved in the New Lenox Rotary Club as its Youth Exchange Officer and has served as a Circuit Visitor for The English District.